Listen to this track by tenacious Hamiltonian indie outfit the Rest. It’s “Who Knows”, the lead off track from their newest record Seesaw, a record that follows up 2010’s Everyone All At Once. The band is based in the extremely fertile, varied, and vibrant scene in Hamilton Ontario. Bands out of the Hamilton scene, many of which I’ve featured on this blog, are hard-working and close-knit. Maybe it’s a working class ethic that drives them to succeed. I used the word ‘tenacious’ above to describe The Rest for good reason. For, The Rest fought harder than most to bring their latest record to us, as if the job isn’t hard enough for an independent band working up momentum for themselves. Here’s the story. One key component to the Rest’s recording process was their producer, former Junkhouse guitarist, and sought-after producer at Caroline North recording studio, Dan Achen (City and Colour, Feist, Mojave), also a friend, and mentor . But, during the recording process, Dan passed away very unexpectedly. Given that he’d played a major part in guiding the band, this loss alone would have been enough to delay the production of the new record. This is not to mention the added burden of losing a friend. But, they soldiered on. Yet, there would be more to face for the Rest in bringing their record into the world. Technology has empowered many a band starting out in this age of Internet, FTP file sharing, and other other computerized innovations. Yet, sometimes technology turns on you, as it did with the record. Due to a hard-drive glitch, the completed tracks they’d worked up were chucked down a deep, digital hole – disaster! But where technology was the cause of seeming failure, it would also provide a solution, too. Black box technology of the kind they use to retrieve information from airplane disasters, they had their record back six months later – disaster averted! The resulting record is a varied beast, with this lead track establishing their overall sound, yet punctuated by other textures including a kind of post-punk afrobeat in another song “Laughing & Yearning“, which aggressively competes with “Who Knows” as my favourite track on the record. Needless to say, the quality is high, with the artists who made it having brought it through the fire to get it to us. During the month of May and into this month, the band released one song per week. 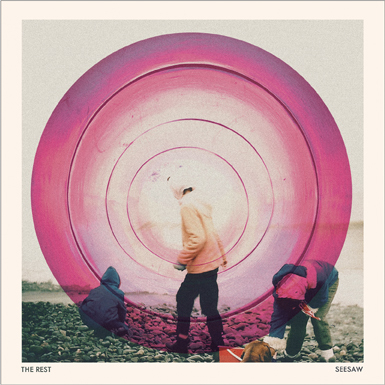 But, now you can buy your copy of The Rest Seesaw in its entirety, including a vinyl copy from Auteur Recordings. For more information about The Rest, investigate The Rest website.